Northam first ran for office in 2007 in the Virginia 6th Senate district, which includes the Eastern Shore of Virginia; Mathews County, on the Middle Peninsula; and parts of the cities of Norfolk and Virginia Beach. He was unopposed for the Democratic nomination. On November 6, 2007, he defeated Nick Rerras, a two-term Republican incumbent, 17,307 votes to 14,499. He was re-elected in November 2011, defeating Ben Loyola Jr., a defense contractor, 16,606 votes to 12,622. One of Northam’s first major activities as a state legislator was to lead an effort to pass a ban on smoking in restaurants in Virginia. The bill failed the first time, but was passed the next year and signed into law by Governor Tim Kaine. Northam ran for lieutenant governor as Terry McAuliffe’s running mate. Northam ran for Lieutenant Governor of Virginia in the 2013 election. Northam competed against U.S. Chief Technology Officer Aneesh Chopra for the Democratic nomination. On June 11, 2013, Northam won the Democratic primary over Chopra with 54% of the vote to Chopra’s 46%. On November 5, 2013, Northam was elected as Virginia’s 40th Lieutenant Governor over Republican E. W. Jackson by a 10% margin, receiving 55% of the vote to Jackson’s 45%.Northam was the first Democrat since Tim Kaine in 2001 to be elected Lieutenant Governor of Virginia. In February 2015, just over a year into his term as lieutenant governor, Northam confirmed his interest in running for Governor of Virginia in 2017. He made these intentions official on November 17, 2015, via an email to supporters. Northam faced former congressman Tom Perriello in the Democratic primary. The primary campaign was seen as a proxy battle between the Bernie Sanders and Elizabeth Warren wing of the Democratic Party, represented by Perriello, and the wing, represented by Northam. On June 13, 2017, Northam won the Democratic nomination with 56% of the vote to Perriello’s 44%. He faced Republican nominee Ed Gillespie in the general election. In October 2017, the Northam campaign released a small number of flyers omitting Northam’s running-mate for Lieutenant Governor,Justin Fairfax. These were released at the request of Laborers’ International Union of North America, which had endorsed Northam (and Northam’s running mate for Attorney General, Mark Herring, who was included on the flyer), but not Fairfax. LIUNA explained that Fairfax opposes the construction of natural gas pipelines that are favored by the organization. As Fairfax is black, while Northam and Herring are both white, some activists criticized the decision to accommodate LIUNA’s request. All houses that received the LIUNA flyers also received standard campaign flyers including Fairfax. During the campaign, Gillespie and President Donald Trump accused Northam of being responsible for the increased activities of theMS-13 gangs and of being “in favor of sanctuary cities that let dangerous illegal immigrants back on the streets.” Gillespie and Trump said that Northam had been the deciding vote to stop a Republican bill in the state Senate which would have banned sanctuary cities and that this contributed to the surge in MS-13 violence; a notion that FactCheck.org found to be “misleading”. TheWashington Post and CNN noted that there are no actual sanctuary cities in Virginia. Gillespie himself acknowledged that Virginia did not have sanctuary cities. The Washington Post furthermore noted that there is no evidence that sanctuary cities increase crime or gang activity, and that Virginia communities with higher immigrant populations have lower crime rates. Later that month, the Latino Victory Fund, which supports Northam, released an ad in which a pickup truck, adorned with a Gillespie bumper sticker, a “Don’t tread on me” license plate, and a Confederate flag, chases down minority children and corners them in an alley—one of the children in the ad then wakes up, revealing the scene to have been a nightmare. Although Northam and his campaign were not involved with the ad, Northam initially defended it, saying Gillespie’s own ads “have promoted fearmongering, hatred, bigotry, racial divisiveness,” and adding, “I mean, it’s upset a lot of communities, and they have the right to express their views as well.” The ad was pulled the following day in the hours after the terrorist attack in New York City, in which a man killed several people by running them over with a truck. Northam then distanced himself from the ad, re-emphasizing that it was not released by his campaign and saying that it is not one that he would have chosen to run. A spokesman for the campaign said that the Latino Victory Fund’s decision to pull the ad was “appropriate and the right thing to do.” FOX 5 DC reported that the Northam campaign had accepted $62,000 as an in-kind media contribution from the Latino Victory Fund. In the final week of the campaign, Northam stated that he would as governor sign a bill to ban sanctuary cities in Virginia similar to a bill he had voted against in the state Senate earlier in 2017. In response, the progressive group Democracy for America stated that it stopped direct aid of Northam’s campaign. Howard Dean, who founded Democracy for America, but left the organization in 2016, wrote on Twitter that the organization had discredited itself and called its decision to stop aiding Northam’s campaign “incredibly stupid”. Democracy for America had already stopped collecting data for Northam and had ceased mentioning him in get-out-the-vote calls due to his campaign’s decision to remove Justin Fairfax from certain campaign fliers. Northam held campaign rallies with former President Barack Obama and former Vice President Joe Biden during the general election campaign. According to the Washington Post, Northam owns stock in several companies “doing extensive work in Virginia”. Northam has stated that if elected governor, he would place his financial investments into a blind trust, so as to avoid any potential conflicts of interest. According to the Virginia Public Access Project, as of November 3, 2017, Northam has raised $33.8 million to Gillespie’s $24.5 million. Northam was elected 73rd Governor of Virginia on November 7, 2017, defeating Ed Gillespie in the general election with a larger-than-expected nine-point margin of victory. Northam was sworn in as Governor of Virginia at noon on January 13, 2018 at the State Capitol. He became the second Eastern Shore native to serve as Governor of Virginia, after Henry A. Wise (who was elected in 1855) and the second alumnus of Virginia Military Institute to serve as governor, after Westmoreland Davis (who was elected in 1917). A majority of Northam’s cabinet secretaries are female, a first in Virginia history. Residents from every county in Virginia attended Northam’s inauguration (which reportedly marked another first for the state) and twenty-six groups participated in the inaugural parade, which has been called the largest and most diverse in state history. The Washington Post described Northam as a moderate state senator who moved to the left on some issues during the 2017 gubernatorial Democratic primary, such as support for a $15 minimum wage and opposition to a state constitutional amendment enshrining right-to-work legislation. Northam supports abortion rights. In the Virginia General Assembly, he opposed a bill to mandate vaginal ultrasounds for women seeking abortions, and voted against the bill when it was revised to mandate only abdominal ultrasounds. He was endorsed in the 2017 Democratic gubernatorial primary by the abortion rights group NARAL and its Virginia affiliate. Northam has argued for reducing abortion rates through education and expanding access to contraceptives.Planned Parenthood pledged to spend $3 million supporting Northam in his 2017 general election campaign for governor. Northam opposes banning abortions after 20 weeks through a state version of the Pain-Capable Unborn Child Protection Act. On the controversies over public monuments to the Confederacy, in June 2017 Northam stated that the statues in the state Capitol that the General Assembly has jurisdiction over “should be taken down and moved into museums”, and that the decision on other statues “belongs to local communities.” He has said that there should be more public memorials to historical Virginia civil rights leaders such as Barbara Rose Johns, Oliver Hill, and Samuel Wilbert Tucker. In August 2017, Northam took a firmer stance, saying, “I believe these statues should be taken down and moved into museums. As governor, I am going to be a vocal advocate for that approach and work with localities on this issue.”According to the Washington Post, Northam later reverted to his original stance that decisions on the monuments should be made locally. Ralph Northam is opposed to the death penalty. As governor, there have been no executions in the Commonwealth. During his 2017 campaign for governor, Northam has said that if elected, he will only approve a map of new Virginia legislative and congressional boundaries in the post-2020 redistricting that is drawn by a nonpartisan commission. Northam has proposed making it free for students to pursue a community college education or apprenticeship in a high-demand field (such as cybersecurity and early-childhood education) under the condition that they commit to a year of paid public service. 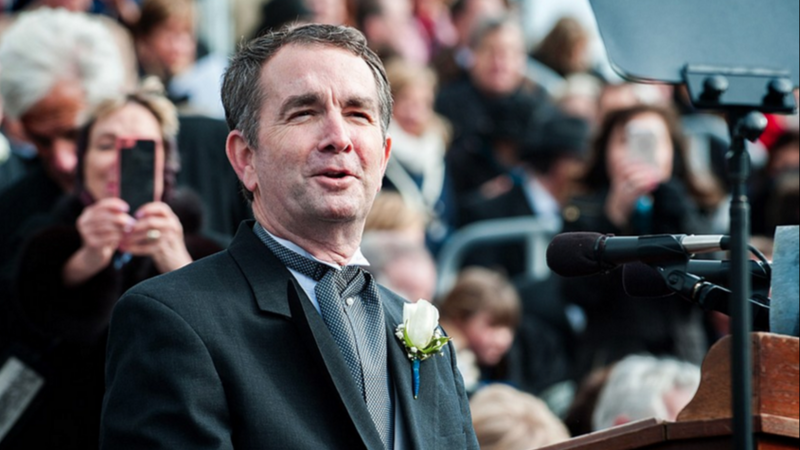 Northam opposes public funding for private schools. Northam accepts the scientific consensus on climate change and as a candidate for governor vowed to lead efforts to fight climate change. He has pledged, if elected, to bring Virginia into the United States Climate Alliance, a multi-state agreement to upholdgreenhouse gas emissions standards. Northam has emphasized the negative effects of climate change-induced sea level rise on Virginia’s Tidewater region. During his 2017 campaign for governor, Northam pledged if elected to continue implementing the total maximum daily load limits for nitrogen and phosphorus discharges into Chesapeake Bay, a policy that had reduced harmful algal blooms. Northam said he would continue this policy even if the federal government under Donald Trump cut or eliminated funding for the program. During his campaign, Northam was endorsed by the Virginia League of Conservation Voters and the Virginia Sierra Club. Northam has offered conditional support for the proposed Atlantic Coast Pipeline, provided that the pipeline’s construction is deemed to be environmentally safe. He has avoided taking a firm stance on other pipelines such as the Mountain Valley Pipeline. He opposes both offshore drilling and fracking. He opposes a single-payer healthcare system in Virginia, preferring that such a plan would be run by the federal government, but supports the creation of a state-run public health insurance option. In his 2007 campaign for state Senate, Northam “advocated for Virginia being ‘even more stringent than we are now in fighting illegal immigration,’ and said the state should act as ‘strong partners’ with federal law enforcement.” Northam’s rhetoric shifted in his 2017 gubernatorial campaign. In 2017 Northam pledged to “stand up against ICE” so that “people, especially immigrants, in Virginia aren’t living in fear,” saying: “Something that we are very proud of in Virginia is that we are inclusive.” He continued by saying “We will do everything we can to make sure immigrants are comfortable living here.” Northam opposed President Trump’s decision to rescind Deferred Action for Childhood Arrivals (DACA), which offered temporary stay for unauthorized immigrants who came to the United States as minors.Northam said Trump’s “decision lacks compassion, lacks moral sense, and lacks economic sense.” Northam supports granting state driver’s licenses and in-state tuition to unlawful immigrants. In February 2017, Northam cast a tie-breaking vote in the state Senate against a bill to ban sanctuary cities in Virginia. Northam said he was “proud to break a tie when Republicans tried to scapegoat immigrants for political gain” and that he was “glad to put a stop to” the bill. In an October 2017 debate, Northam said he did not support sanctuary cities, stating that there currently were none in Virginia, but Northam declined to say whether he would sign a bill as governor that was similar to the one he voted against in the Senate. In November 2017, Northam said that he would indeed sign a bill similar to the one he voted against. As Governor, Ralph Northam vetoed a law banning sanctuary cities. Northam has proposed an increase in Virginia’s minimum wage from its current level, $7.25 an hour, to $15 an hour. 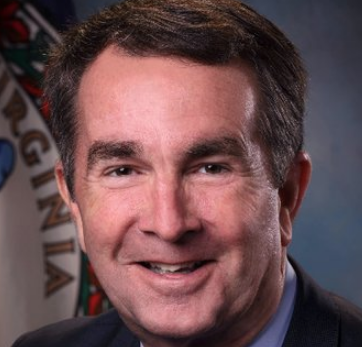 During his 2017 campaign for governor, Northam was endorsed by the Laborers’ International Union of North America; the union praised Northam for his opposition to a “right-to-work” amendment to the Virginia state constitution. [Northam criticized the repeal of the car tax under former Governor Jim Gilmore because of its impact on both K-12 and higher education, saying Virginia still has not recovered. Northam “has called for phasing out the grocery tax on low-income people and ending business taxes in struggling rural areas.” He has called for a bipartisan reform commission to make recommendations on state tax policy. If you have any questions for Ralph Northam, send them to Virginia onAir at virginia@onair.cc. Virginia will first see if Ralph Northam has answered your question somewhere else. If they haven't, Virginia will pass on your question to Ralph Northam and post their answer, if they have one. If you have any suggestions for Ralph Northam, especially if you are a current or former constituent, send them to Virginia onAir at virginia@onair.cc. Virginia will record your suggestions here. If you have something positive to say about Ralph Northam and you are a Virginia onAir Hub member, send your recommendations to Virginia onAir at virginia@onair.cc. My name is Virginia onAir. I am the lead curator for this Ralph Northam post.